For the Chinese, classical painting is a symbol of the highest spirituality. In his work, Souffle-Esprit, Francois Cheng brings together a collection of texts considered essential to Chinese aesthetic thinking and pictorial art. Extending over more than one thousand years since the T’sang (618-907) to the Ts’ing (1644-1911), the texts show to what extent this pictorial language is marked with codes and senses, aesthetically and philosophically. Many rules and concepts frame Chinese pictorial art, notably those of fullness and emptiness, the visible and the invisible, breath and spirit, the achieved and unachieved and finally, Yi. I chose three very interesting passages from the book, which deserve our attention, in my opinion, because they can be applied not only to pictorial Chinese language but also to all forms of expression and, in a certain way are also related to a way of designing our choices and actions. “During implementation, Yi must guide the paintbrush’s movement. This is to say that all lines traced must be carried and extended by Yi; it would be upsetting, on the contrary, that a line give the impression of having gone too far, in relation to Yi. For the true achievement of a line lies in the very fact of letting itself be perfected by Yi, and not at all in the over achieved.” Pu Yen-t’u (Ts’ing Dynasty). Yi is most simply translated by: idea, intention, meaning and correct vision. 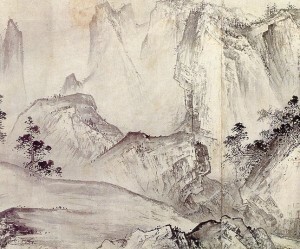 Here is a brief introduction to Chinese pictorial art and its main rules. I find it particularly interesting to reflect on the philosophical depth of these concepts and how they can resonate in multiple aspects of our lives. François Cheng, The French Academy. Author of several works on Chinese pictorial language.